Step 1 Season steaks with salt and pepper, and let stand 10 minutes at room temperature. Step 2 Combine soy sauce, sesame oil, Worcestershire sauce, garlic, and brown onion in blender and puree until smooth. Pour over steaks and marinate 5 to 10 minutes. Step 3Remove steaks from marinade. Cook steaks on grill pan over high heat until desired doneness, about 3 to 5 minutes per side for rare. (Steaks can also be cooked on outdoor grill.) 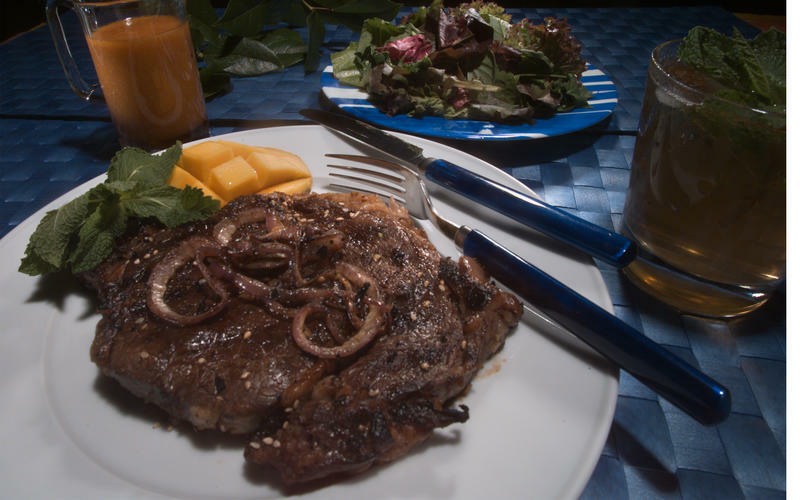 While preparing steaks, grill red onion a few minutes on each side. Remove steaks from grill pan, sprinkle with toasted sesame seeds and let rest 5 minutes. Serve with grilled onion. In Recipes-list.com we have selected the most viewed recipes from category - Grilled Main courses . Enjoy the best recipes specially selected for you! Kalbi Rib-Eye Steaks is the right choice that will satisfy all your claims.